Got my M2 trigger feeling great! A couple weeks ago I polished the sear face and the work on the ejector. The cylinder was a mirror finish from the factory. I wouldn't call it gritty or smooth. I only feel the uneven pressure when taking very careful aim and pulling VERY slowly. As I pull, a bit past the half way point of travel the required pressure to keep it moving increases then suddenly "breaks free" to continue travel. A short travel later you hit another resistance just before it breaks to release the striker. I would describe it a two take-ups. So if I'm practicing to be most accurate I get through the first resistance and then when I feel the next one I know that any movement will release the striker. You don't feel any grit when doing a normal "follow through" trigger pull. Today is rainy again so being stuck inside I started looking further for the source of the resistance. I was obsessed with getting rid of the uneven resistance. With the slide off pressing on the connecter to load the cylinder didn't cause the resistance that I was feeling. I could reproduce the uneven feel by placing the striker's mating surface against the sear and pushing the striker forward as the spring normally would then pulling the trigger. I had noticed that the sear action pushes the striker back before breaking free but with the slide off I could see the striker "ramp" (I'll call it) drag on the back wall of the slot in the housing that the sear is in. (See the picture with the striker in place.) I looked at the bottom of the striker to see the uneven surface on the "ramp". I polished it and that helped a lot. Then I took the sharp edge off that back wall of the slot and the pull is smooth now. Last edited by GeorgiaJoe; 03-30-2019 at 08:19 AM. Well knock me down and call me shorty, thats great!!! With the slide off pressing on the connecter to load the cylinder didn't cause the resistance that I was feeling. That first bump is the connector depressing the striker safety. With the slide off push the striker rearward while depressing the striker safety. When the striker moves behind the striker safety release the safety to trap the striker. Then try a slow and fast depression of the striker safety.....I believe you will feel a very slight drag when pulling slow. As for the interface between the sear and striker lug I am a bit confused with your description. Try this: Measure the height from the top of the striker lug to the top edge of the slide. Then measured the height of the sear to the top edge of the frame. My measurements yield 20/64ths as the height of the sear and 18/64ths for the striker. That means the interface between the two is only 2/64ths (1/32nd). That's why I get concerned with modification of those surfaces. My guess is that the drag you feel when the sear is dropping down is due more to the coil striker spring and not the two faces of the sear and striker lug. Those two surfaces on my CCP are very shiny and smooth. The improvement you feel after rounding those two surfaces is probably due to the sear dropping off/slipping past the striker lug a little quicker. Last edited by chandler5566; 01-20-2019 at 05:09 PM. This go round I didn't touch the sear or the striker surface that comes in contact with the sear. 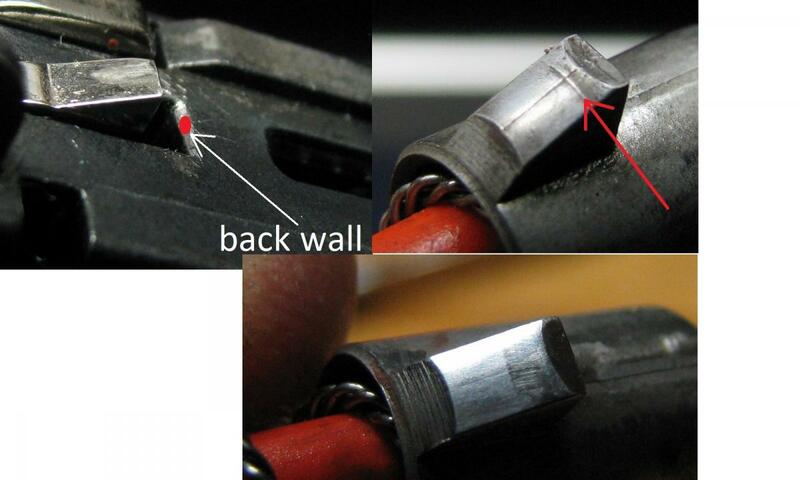 I polished out the ridge on the bottom of the striker that the red arrow is pointing at in the picture attached. 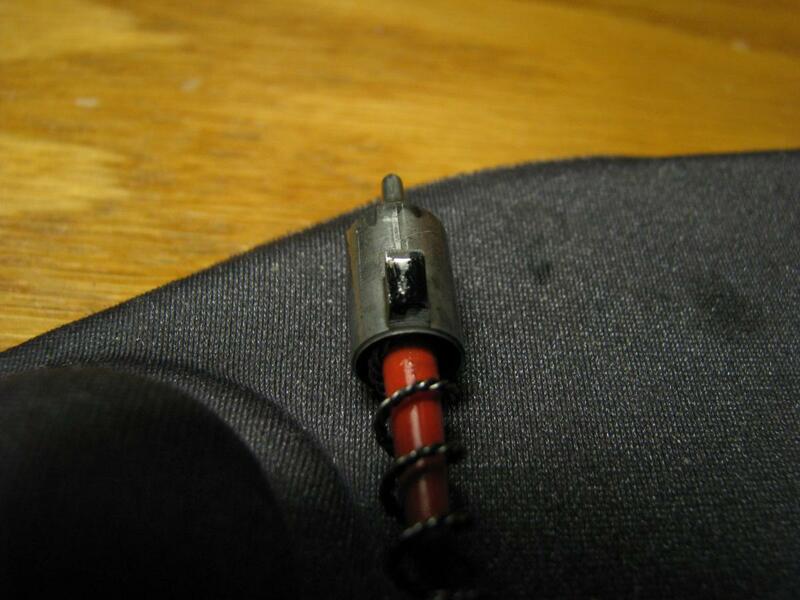 That surface comes into contact with the housing at the spot marked with the red dot which was a 90 degree edge. 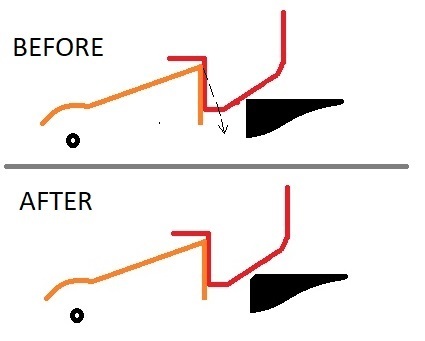 As the trigger was pulled the sear pushed the striker back and the surface that is now polished was dragging on the 90 degree edge where the red dot is until the ridge at the red arrow hung up on the 90 degree edge requiring more pressure to overcome. Once the ridge cleared the 90 degree edge there was a short travel to the point of the striker breaking free of the sear. With the ridge polished off and the sharp edge chamfered there is no hang-up as before. The striker may set a little lower as the chamfer contact to the polished surface allows. The only difference that I feel is the trigger moves with constant resistance requiring a constant pressure until the striker releases. Much smoother than before the polishing and chamfering. The trigger requires the same pressure as before, without the sticking spot, and as well as I can tell the same travel and reset. Last edited by GeorgiaJoe; 01-20-2019 at 06:57 PM. If it were any other pistol I would find this hard to believe. So what you are saying GeorgiaJoe is that with a cocked pistol.....striker hook caught behind the sear....that when you pull the trigger the dropping sear presses the striker rearward as it rotates down causing the rear of the striker hook to hit the steel system housing...red spot. That would certainly screw up trigger pull if not stop it altogether. The last thing a small, light weight, mim'd (?) part like the striker needs is for the hook to be banged into from both directions. I'm surprised metal fatigue doesn't rapidly set in and the hook simply break off. Are you sure you have this analysis correct? When I pull the trigger I can see and feel the red button cocked indicator come further back a little. I think it is from the seer moving down but not straight down; more of a circle radius as the seer rotates downward pushing the striker back. I put some dry erase marker on the surface of the hook that I removed the rough spot from (see the red arrow on "contact" image). You can see that some of the dry erase got scuffed off of that surface after I put it back together in the process of cocking and pulling the trigger. I think that it still comes in contact with the chamfered surface marked by the red dot rubbing the dry erase off. Now that the rough spot that the red arrow points at is gone it is a much smoother trigger pull. It feels like the slide travel is stopped by the spring around the barrel being compressed and the piston getting to the back of it's cylinder. See my "BeforeAfter" image to see my best representation of what I am saying. Note the rough spot on the striker and how it will hang up on the 90 degree sharp edge. I know the striker is setting lower than I would expect but how else is the dry erase getting rubbed off of the striker. And taking the rough spot off definitely smoothed out the trigger pull. Last edited by GeorgiaJoe; 03-30-2019 at 06:41 AM. Very nice illustration Georgiajoe, but i think the witness marks that you are getting, IMO, are when the striker moves over the sear, before it catches it, which in turn, indicates how much surface area, of the striker, is being held by the sear, its just indicated on the back side of the striker "hook". Last edited by Meho1277; 03-30-2019 at 09:36 AM. That explains it. I couldn't see how the striker could be down there. Thanks for the eye opener. Thanks for the eye opener and clearing my tunnel vision. I see its not must me having the occasional double post. Something silly going on with this site.